Although many things can go wrong with a short sale closing, there is a reason to be proactive. Instead of spending your time imaging everything that can go wrong in a transaction, your time would be better spent taking specific steps to stop a problem from occurring in the first place. You've done the hard part, waiting for short sale approval and actually receiving the authorization to move toward closing. 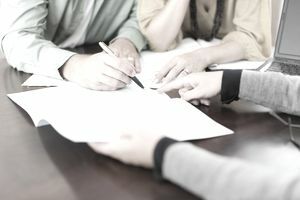 The rest of it should be relatively easy and not much different than a regular real estate transaction, as long as nothing changes and you can meet your closing deadline. Review your good faith estimate and approval letter with your lender. Make sure the closing costs that the seller and you agreed that the seller will pay is authorized by the short sale bank in the short sale approval letter. If there is a shortage, find out who will pay it. If it is the seller, will the short sale bank allow the seller to pay it? You need some sort of proof that the closing costs approved in the letter match the costs agreed to in your purchase contract. This can be a huge issue at closing if you are suddenly hit with unexpected buyer's closing costs. Moreover, it might delay closing if you need to sign a new GFE. Payment to the second lender. Both the first lender and the second lender letters should specify the amount paid to the second lender, and that amount should be the same. Approved buyers. Sometimes buyers want to add other individuals to the deed at closing. Those individuals should be named in the approval letter. You can't have one letter from the first lender that approves Mary Jones as the buyer, and another letter from the second lender that approves Mary Jones and David Jones as the buyers. Closing date. If you cannot close by the earliest date between the two letters, then you will need to get a short sale extension from that lender. There are problems associated with financing a short sale. From the appraisal to underwriting, guidelines are strictly enforced. One little blip can cause a short sale loan to get stuck in underwriting and denied. You might have funding conditions in that loan. The question could become who will take care of, say, FHA repairs noted in the appraisal? If the seller is selling "as is," the seller might refuse to comply with funding conditions. But the real world is if the seller refuses to help the buyer meet funding conditions, the short sale won't close unless the buyer does it. Buyers don't want to make repairs to a home the buyer does not own. If the seller refuses to help work out funding conditions, be prepared to tackle those projects yourself. And get permission from the seller in writing. Most responsible sellers will help a buyer clear funding conditions.